Definition: Spirits that are stuck between the Spirit World and the Earth Sphere. They are also known as Ghosts. One day, while checking my e-mail, I received an e-mail from one of my cousins. She had written to thank me for a recent visit to her home. Although the e-mail was pleasant and thoughtful, it was the last part of the message that I found intriguing. She wanted to know what it was that I was observing during my visit to her home. Apparently, according to her, I was staring at a particular area in her home. Bewildered by her observation, I wrote to her back. I expressed my confusion, and stated that I did not recall staring at anything in particular. In fact, if my attention was focused on a particular area of the house, perhaps some spiritual activity was present that I was not consciously aware of. Then, something strange happened. I stopped writing, closed my eyes and had a vision. In the vision, I saw a little girl crying. She was standing near the door of one of my cousin’s rooms. It seemed as if she was in search for someone or something. Additionally, the little girl’s energy was extremely intense. Even though other details were shown, I cannot recall them now. When I opened my eyes, I immediately typed all the details of the vision and pressed the send button. The e-mail was on its way. I waited patiently for a response but received none. The next day, I woke up thinking about the vision, and wanting to unravel the mystery. Was there, in fact, a spirit of a little girl in my cousin's home, and if so, why was she there? By the end of the day, and no e-mail from my cousin, the thought of the little girl vanished from my mind entirely. Then, I received a phone call that changed everything. The called was from another cousin-the sister of the one I had e mailed. She had called to chat for a while. During the conversation, she revealed that her sister had told her about my e-mail. Moreover, she said that she was going to call me. Then, she began to tell me the story of the little girl. Apparently, the previous owners of my cousin’s house had a little girl. It seemed that there was an accident in front of the house in which the little girl was struck by a car and killed. It is believed that the father was pulling out of the driveway when she was hit. During renovations to the interior of the house, my cousin discovered pictures and drawings that belonged to the little girl. Instead of discarding them, my cousin decided to keep them in the same place. On various occasions, my cousin, her daughter and granddaughter had seen and felt the presence of the little girl in the house. After hearing the story, I was grateful to God for allowing me to be a witness to this tale. Now, I understood the true meaning of the vision. The little girl had lost her way back home. She was stuck in a house that she did not belong. It seemed that after the loss of their little girl, the parents were devastated and unwilling to let go. They kept her pictures and drawings tucked away in the walls of their house. Unable to cope and overcome the death of their child, they decided to sell the house and move on, while the little girl remained stuck. The little girl appears to be lonely and sad. I believe that by making contact she is asking for spiritual guidance. Her ties to those left behind have kept her locked in a home that was once hers. Her parents' unwillingness to let her go and her search for her loved ones have kept her earthbound and unable to move on to the spirit realm. As she roams about in search for a familiar face, she sees none. She sees strangers moving around in the place she once knew as home. She wonders who are these new and strange faces, and where are her loved ones. Day in and day out, the search and wait continue, hoping to be reunited with her parents someday. Spirits, especially those who leave the body abruptly, are in constant need of spiritual assistance and prayers. Prayers help them in the transition from corporeal life to spiritual life.
" Today, my daughter called the Police Department to find out if the story was true about the little girl. A few minutes ago, I received a call from the Officer telling me that he spoke to the Officer, who responded to the accident. The Officer confirmed that death of a little girl at that address. She was caught under the car when the driver was putting the car in reverse." Almighty God, may you receive and embrace the soul of (name) who you have just called. Let him/her glimpse at your divine light and allow it to shine on him. Pull (name) out of the darkness, and guide him into the light. Allow his eyes and ears to see and hear the good spirits, and may they show him the path to eternal happiness. 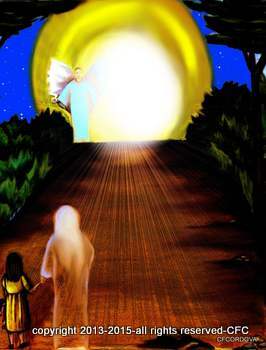 Good spirits, who have come to receive him, and above all his guardian angel, give him spiritual guidance, and show him the light. Alleviate his confusion, which is part of the transition from corporeal life to spiritual life. As you embark on your spiritual journey, may God allow the good spirits to come to your aid and give you spiritual guidance. Let them surround you, and unlock your terrestrial chains. God has permitted you to be the first one to be free- to release yourself from the earthly body and go back home. Our separation is momentary. We will be together once again. At the moment, there is only a material veil that is hiding you from my sight. Although you have entered the spirit world, you are present among us. You can see and hear us better than before. Don’t be afraid. Allow the good spirits to take you into the light. Commence your journey, and remember that we will meet again. I will not forget you, and I pray that you will not forget me. The same way you have or will be reunited with the ones who have preceded you, we too will be reunited. Please, save me a place in heaven. Part of the above prayer was taken from the Collection of Selected Prayers Book by Allan Kardec. Click here supernatural phenomena, and read more about spiritual encounters from a psychic medium and spiritual healer. Her web site consists of her personal experiences, which are extremely appealing, and worth reading. (This link will open a new window in your browser).